What Do I Get My Family For Christmas? 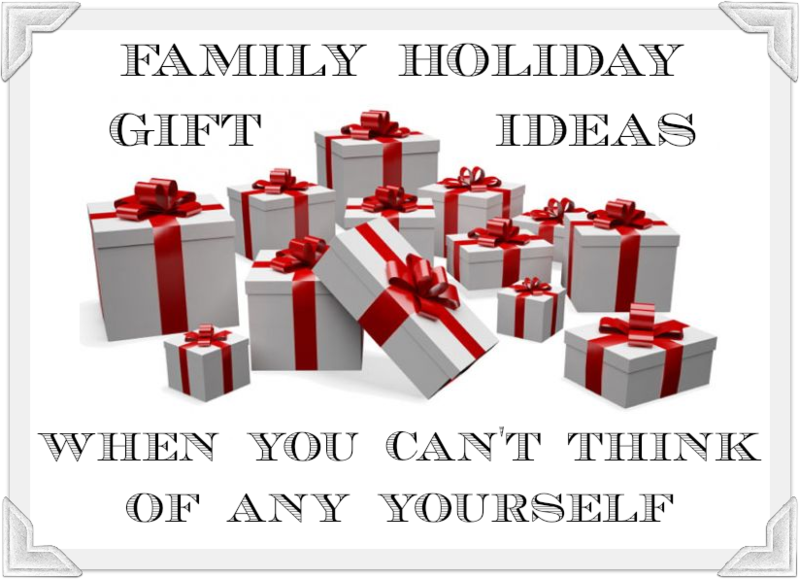 In going through and creating this holiday gift giving ‘list’ I realized it might help others figure out what to do for their families this year especially if you are stuck or hate purchasing presents for the sake of having something under the tree. As a mom that has to clean up the same toys day after day, I am all for less clutter and unloved toys and more of a focus on loving what you have and treating it properly. Better yet, I would LOVE to transition my family to enjoy ‘experiences’ for holiday gifts. As my husband pointed out, the kids won’t be thrilled if I go ‘cold turkey.’ Try explaining to our five year old son & 11 year old daughter that there is nothing under the tree for them because Mommy thought it was best to clear out a section of the (unfinished) basement to dump your crap make for a dedicated play area for you. As I need to find at least some items to wrap and put under the tree I’m consulting with Google and Amazon as well as finding recommendations from other bloggers. I will also browse Pinterest and see how many ‘homemade’ gifts I can make for friends as well as family. I am making gourmet inspired chocolate covered pretzel and bacon so much I’ve decided to sell them as a side hobby (you know, in all my spare time). My kids won’t want any as gifts, but it makes a great hostess or office gift for when I need them. This year I would like to start migrating to a few really nice gifts and something that is meant for us as a family. In the beginning it might be a ‘family’ video game (hey, we are a geek gaming family after all) and a home project that we can complete and enjoy together. Lets be realistic I’m just looking for free labor to clean out the basement and move the kids toys out of my living room so we can have more company over without the embarrassment of ten thousand LEGOs on the floor. My daughter is 11. She has a cell phone and seems to have outgrown most toys. Clothes are a hard purchase for her because I always need to have her with me so she can try things on. Of course the default items to give a preteen are gift cards. In her case, this will mostly be iTunes, Amazon, and Barnes & Noble. My only thing close to a helpful list so far is the Amazon 2012 Holiday Toy List that gives me some ideas for her age bracket. Of course if there is a way to purchase gifts locally and from small businesses, I will. Otherwise we have Amazon Prime and I will shop from the couch. One thing I know she asks for is books. She is an avid reader and practically eats books, but because her reading level is much higher than her age. I have a problem with finding age-appropriate content while still having a high reading level. I learned that lesson when a few years ago I let her pick out a book from the Young Adult section of the bookstore only to have her ask me what “second base” was – she was nine. Uh, yeah, not so much. I feel the DS would have a longer shelf life. We have an older version of a LeapFrog handheld device and my daughter outgrew it’s age bracket pretty quickly. My son plays with it now even though it is pink and has ‘girl’ games on it. My little dude likes all the games that we have (2) for the LeapFrog and is pretty gender-indifferent (as is my daughter) when playing with toys. His other interests are pretty much LEGO (we have tons) and anything TRON, Transformers or Iron Man (I love Iron Man also, but mainly for Tony Stark and for different reasons than my son does). I’m sure he would love some more NERF guns but I hate enabling him with weapons to haze his sister (and the dogs) with. This is the first year I have actually found decent and very useful gifts for my husband. Usually he says that he needs a new tool set or video game and purchases it – and lets me wrap it and make the kids think it was an original idea. I will have to come back to this post after the holidays and list out what they are because he reads my blog. I even have 50 great stocking stuffer ideas thanks to The Art of Manliness. Together as a family we are gamers – computer, console (Wii & XBOX), portable handheld, and board games. My husband usually buys himself and the kids any board games he finds that we have an interest in, but family-oriented XBOX Kinect games are a great holiday option for me to purchase. My friend Cecily has been reviewing family-friendly XBOX games and gave a great suggestion for an easy to do exercise and yoga game Your Shape Fitness Evolved 2012 she has been using with her mom. I think some new Just Dance Disney Party games are on the list as well this year (I love UBISOFT, they have been sponsors of some parenting conferences I have spoken at and are always a big hit). I’m with you on the DS versus Leapfrog stuff. My daughter had whatever the Leap Frog portable gaming system was at the time when she was 3, and by 5 – most of the games were starting to be way below her. The DS Lite she got at 5 is still going at 9 1/4 and she has transitioned from the Disney and cute Petz games she started with to more mature games like Pokemon, Sims Agents, and Monster High. Pokemon really took hold as a number of her classmates also have it (both boys and girls) and they can interact wirelessly to trade and battle – and it lead to the Pokemon card game which she also plays with other people at a local hobby store in a league. There is WAY more variety in games for the DS and she often buys used games at bargain prices too. Dis I also mention I really don’t like being locked into a totally proprietary system for buying software for a handheld? Yeah – that is what Leapfrog does. They publish it all. It is not hard to find the educational games for the DS. Even if they are out of production they are cheap and easy to get used online, plus the purely fun ones for the kids no matter what Licensed properrty they are into are all there too. Lego you say? Oh yes…plenty of Lego titles on the DS!